2. University of Chinese Academy of Sciences, Beijing 100049, China. Cancer is one of the leading causes of death worldwide. Many treatments have been developed so far, although effective, suffer from severe side effects due to low selectivity. Nanoparticles can improve the therapeutic index of their delivered drugs by specifically transporting them to tumors. However, their exogenous nature usually leads to fast clearance by mononuclear phagocytic system. 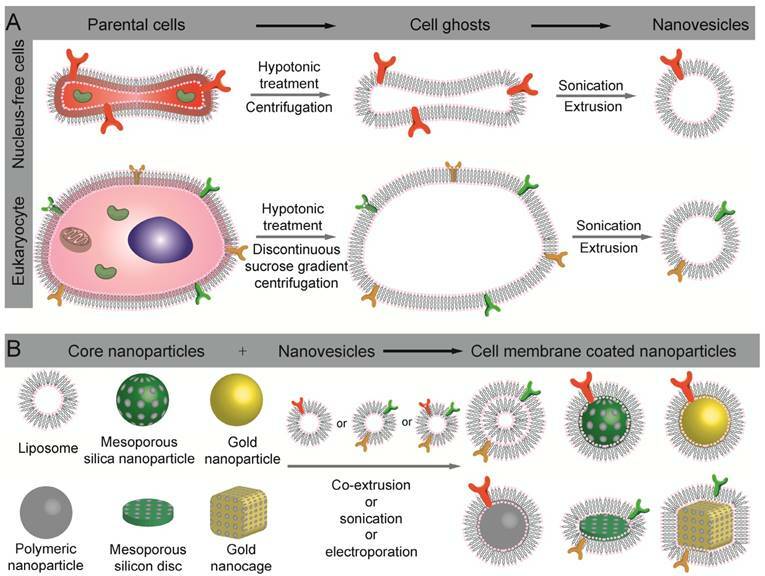 Recently, cell membrane-camouflaged nanoparticles have been investigated for cancer therapy, taking advantages of excellent biocompatibility and versatile functionality of cell membranes. In this review, we summarized source materials and procedures that have been used for constructing and characterizing biomimetic nanoparticles with a focus on their application in cancer therapy. Keywords: Cell membrane, Nanoparticle, Camouflage, Cancer. Cancer is one of the leading causes of death worldwide . Surgical resection and localized radiotherapy are routine treatments for the disease in clinic, usually followed with systemic therapy aiming to eradicate non-resectable and metastasized tumors. However, most systemically delivered free drugs are of low specificity, causing severe side effects that prevent dose escalation and therefore effective tumor suppression [2-4]. To improve the specificity, nanoparticles that can modify the pharmacokinetic properties of encapsulated drugs have been developed, some of which are already in clinical use [4-11]. Ideal nanoparticles for drug delivery should have prolonged blood circulation with capability to target tumor tissue, to bind cancer cells, and to enter the cytosol of cells [4, 6, 12, 13]. The size, morphology, and more profoundly surface properties of nanocarriers are key determinants for their functions [14-17]. For instance, surface modification of nanoparticles with hydrophilic and flexible polymers such as poly(ethylene glycol) (PEG) could prolong half-lives of nanoparticles and contribute to their accumulation in the tumor sites via enhanced penetration and retention (EPR) effect [18-25]. Decorating long-circulating nanoparticles further with functional moieties such as targeting ligands or cell penetrating peptides (CPPs) is able to increase their cellular adhesion and uptake [4, 26-28]. So far, most nanoparticle-based delivery systems focus on primarily synthetic strategies, which require tedious chemical synthesis and optimization especially when trying to integrate multiple functional modalities into one single nanoparticle. In addition, synthetic materials are not satisfactory in biocompatibility, and accelerated blood clearance (ABC) has also been observed from PEG which was previously believed to be inert [29, 30]. As a result, nanoparticles with tunable surface properties and good biocompatibility are desired. Nature-derived materials provide enormous source for nanoparticle engineering [31-35]. In particular, the surface property of nanoparticles can be easily engineered by coating particles with membrane derived from cells or bio-vesicles of different types [36-38]. The resulting membrane-coated nanomedicines (CNs) are highly biocompatible, and can realize prolonged circulation and/or tumor-targeting depending on the nature of their shell-membrane [39-42]. So far, many types of membranes have been used to construct biomimetic core-shell nanoparticles for cancer therapy (Table 1) [41-47], including membranes from red-blood-cells (RBC), platelets, bacteria, white-blood cells (WBC), cancer cells, stem cells and etc. Each type of cell membranes has distinct functions in drug delivery, which will be detailed in the following sections. So far, the CNs have been successfully used in areas of detoxification, vaccination, cardio-vascular diseases and cancer management [11, 36, 40-43, 48]. In this review, we mainly focus on the recent advances in the development of cell-membrane coated nanoparticles for cancer therapy. We discussed the techniques that have been developed for membrane collection, inner particle coating and CNs characterization, and then highlight the applications of CNs in the treatment of tumors and their metastasis. Finally, we briefly discussed the possible challenges for the clinical translation of this approach. The preparation of cell-membrane coated nanoparticles involves three steps, including membrane extraction from cells or bio-vesicles, core nanoparticle preparation, and the fusion of the two into core-shell nanoparticles (Fig. 1). To obtain bio-active CNs, each of the three steps is critical. Membranes of cells and bio-vesicles are asymmetric phospholipid-based membrane embedded with functional surface proteins which are crucial for their bio-functions . To minimize possible denaturation of the membrane-oriented proteins, plasma membrane extraction must be as gentle as possible, and typically includes steps for cell lysis and membrane purification. Depending on whether the source cells have nucleus or not, detailed procedures should be modified accordingly. Nucleus-free cells in human are highly differentiated cells that exert specialized function such as cargo delivery. RBCs and platelets are two of this category, which deliver oxygen and platelet-derived growth factors to the whole body and injured tissues, respectively. To fulfil their tasks, RBCs display membrane proteins (e.g. CD47) that enable their prolonged circulation in the blood (up to 120 days ), while platelets have membrane proteins to bind P-selectin and CD44 that would only expose to blood under pathological conditions . To obtain bio-active membranes from RBCs and platelets, the cells were firstly isolated from whole blood using blood fraction isolation kits and centrifugation-based methodology, and then lysed with either a hypotonic treatment or repeated freeze-thaw process. Soluble proteins were removed via centrifugation, and the purified vesicles were subsequently extruded through polycarbonate membranes with nanosized pores to obtain nanovesicles for fusion. To maintain the bio-activity of membrane, protease inhibitors were usually added to the samples stored at 4 ℃ [52, 53]. Prokaryocyte such as bacteria is another catalog of nucleus-free cells, the membrane of which contains many proteins and thus can be used to induce immune response against the microorganism when used as vaccines. In addition, it has been reported that certain strains of bacteria such as Clostridium beijerinckii, Bifidobacterium bifidum and Salmonella typhimurium have tumor-targeting capability, allowing tumor targeted drug delivery . In contrast to RBC and platelets, bacteria are wrapped by peptidoglycan in addition to cell membrane, which makes cell membrane extraction challenging. Fortunately, many Gram-negative bacteria secret outer membrane vesicles which can be directly collect from the bacteria-filtrated culture medium via ultrafiltration, and therefore no cell lysis is necessary . The membrane can also be easily engineered for desired purpose such as targeted drug delivery . Eukaryocyte such as leukocytes have highly specialized functions, providing enormous source of bio-active membranes for nanoparticle decoration. Compared with nucleus-free cells, the extraction and purification of membrane from the eukaryocyte are more complicated. First, sufficient amount of targeting cells should be harvested from culture dishes (cancer cells or stem cells) or blood and tissue samples (leukocytes) [57-60]. Extensive enrichment and purification are necessary if the targeting cells are rare in the blood or tissues. The cells were then lysed with combination of hypotonic solution treatment and/or mechanical membrane destruction (e.g. extrusion) followed with discontinuous sucrose gradient centrifugation to remove intracellular biomacromolecules, intracellular vesicles and nucleus [43, 59]. The membrane rich fraction was then washed with isoionic buffers to obtain cell-membrane vesicles, which were further sonicated and extruded through porous polycarbonate membrane to give nanosized vesicles [60, 61]. In contrast with the CNs shells that are derived from living cells, their inner cores are mainly made of synthetic materials (Table 2), including poly(lactic-co-glycolic acid) (PLGA), poly(ε-caprolactone) (PCL), gelatin, silicon nanoparticles, mesoporous silica nanocapsules (MSNs), liposomes, gold nanoparticles (AuNPs), Fe3O4 nanoparticles, and etc [45, 46, 53, 59, 62-67]. The choice of core nanoparticles depends on the properties of the cargos to be delivered. Schematic illustration of the preparation of cell-membrane coated nanoparticles. (A) Extract of intact cell ghost from parent cells and further processing into nanovesicles. (B) Different types of nanoparticles that have been used as inner cores, and their fusion with nanovesicles to construct cell membrane coated nanoparticles. Polymers are widely used materials for drug delivery, among which are PLGA, PCL, gelatin, and polyacrylamide. PLGA is a FDA approved polyester with tunable biodegradability and good biocompatibility , which can form nanoparticles of different size using methods such as nanoprecipitation and emulsion [52, 69-71]. In the preparation of inner core nanoparticles, PLGA with terminal carboxyl group are preferred. The terminal carboxyl groups generate a negatively charged surface that can repel the homo-charged outer leaflet of cell membrane, ensuring correct topological orientation of the cell membranes on the PLGA nanoparticles . On the contrary, the size and drug loading have negligible if any effect on membrane coating efficiency [14, 36]. PCL is another type of polyester that has been used to construct inner cores, because of its biodegradability, biocompatibility and low glass transition temperature . Compared with PLGA, PCL is more hydrophobic with slower degradation, and is thus more suitable for prolonged drug release. In addition to the hydrophobic polymers, hydrophilic biopolymers such as gelatin and polyacrylamide have also been used to build nanogels as cores of CNs [60, 74, 75, 78, 129]. Gelatin is a natural polypeptide derived from the connective tissues of animal, and has been widely used in cosmetic and pharmaceutical industries because of its biodegradability, biocompatibility and low antigenicity [74, 75]. After crosslinking, gelatin is able to form nanogels that can be used as carriers for hydrophilic drugs such as doxorubicin (Dox) and vancomycin, the release of which are controlled by cell membrane coating . Synthetic hydrophilic polymer such as polyacrylamide has also been used to construct core nanogel of CNs for Dox . Regardless of the materials, all these core nanogels were around 100 nm, with a significant negative charge (< -20 mV). Polymeric nanoparticles are ideal carriers for hydrophobic drugs. Liposomes, on the contrary, are capable to deliver both hydrophilic and hydrophobic drugs . More importantly, the surface properties and size of the liposomes could be easily engineered by varying the types of component lipids and by extrusion liposomes through membranes of different pore sizes, respectively. Recently, cell-membrane coated liposomes have been used for the delivery of emtansine . Silicon is a type of materials that have been widely used in the preparation of semiconductors, and can easily be processed at nanoscale in large quantity. Due to its good biodegradability and biocompatibility, silicon nanoparticles of different morphologies and functions have been evaluated in biomedical applications , and previous studies showed that disc-shaped microparticles were superior to sphere- or rod-shaped ones in regards to establishing interactions with endothelium, while disc with diameter of ~ 1 and >2 μm were able to target breast and lung cancer, respectively . Dox-loaded silicon nanoparticles have been used as core nanoparticles which form leukocyte-CNs through electrostatic attraction with leukocyte-derived membrane of ~7.41 mV . In addition to leukocyte membrane decoration, their disc-shape may also contribute to the reduction of phagocytosis by Kuffer cells in the liver . MSNs are silica-based nanoparticles with uniform cylindrical pores which could be loaded with drugs for cancer therapy [64, 65]. Different from silicon nanoparticles, the sizes of cylindrical pores and MSNs can both be tuned via different starting materials and preparation protocols during synthesis. As a result, MSNs have been used as carriers for cargos of different sizes, and it is also possible to control the drug release rate via adjusting the size of the pores . In order to be encapsulated by cell membranes, MSNs with slightly positive surface charge was used . AuNP is another type of inner cores that have been enveloped with cell membranes. Compared with the previous discussed nanoparticles, gold nanoparticles are characteristic for their localized surface plasmon resonance (LSPR) effect, which could convert adsorbed light into heat for cancer hyperthermia therapy and light-controlled drug release. Zhang's group first demonstrated that 70 nm AuNPs (with a negative ζ-potential at ~ -42.2 mV) could be coated with RBC membrane . Lately, gold nanocage and gold nanoshell were used in order to maximize the LSPR effect [63, 85, 86], since hollow nanoparticle such as gold nanocage is more efficient in converting light into heat . Regardless of their morphology, the sizes of those inner cores were 60-100 nm in diameter, with ζ-potential at -13.2 and -16.5 mV [63, 85, 86]. Very recently, clustered Fe3O4 magnetic nanoparticles (MNs) has been used as core of CNs for photothermal therapy of cancer , because MNs possess broad photoabsorption in the near-infrared (NIR) range and can convert the energy to heat . MNs can also serve as contrast agents for magnetic resonance imaging (MRI) because of their superparamagnetic properties, and are biocompatible and biodegradable . In order to achieve prolonged circulation and efficient encapsulation, MNs of ~80 nm with ζ-potential at -15 mV were prepared for encapsulation. The success in demonstrating the versatility of cell membrane coating strategy using different core nanoparticles allows one to choose suitable nanoparticles for specific drug and purpose, as each type of core nanoparticles have their own pros and cons (Table 2). For instance, polyesters such as PLGA and PCL are suitable for sustained delivery of hydrophobic drugs, while nanogels and liposomes are compatible with hydrophilic drugs although suffering from fast drug leakage. Inorganic nanoparticles can be easily engineered into different sizes and shapes, the adjustment of which parameters might be used to regulate the pharmacokinetic behavior and cellular uptake of nanoparticles [16, 81, 91-93]. However, most inorganic nanoparticles showed slow degradation and elimination in the body, which could be a potential problem for biomedical applications. It is clear therefore that the core nanoparticles play a crucial role in determining the drug releasing, size and shape of CNs, and should be carefully crafted for different purposes. The prepared cell membrane vesicles and core nanoparticles need to be fused together to obtain CNs. The fusion process should be efficient, but must not induce drug leakage and protein denaturation. Membrane extrusion and ultrasonic treatment are the two most frequently used methods in the literatures [37, 60, 61, 63, 86, 94-97]. Membrane extrusion technique was firstly employed, which involves sequential extrusion of samples (mixture of cell membrane vesicles and core nanoparticles) through pores of different sizes. Although this technique is effective, large scale preparation is challenging. 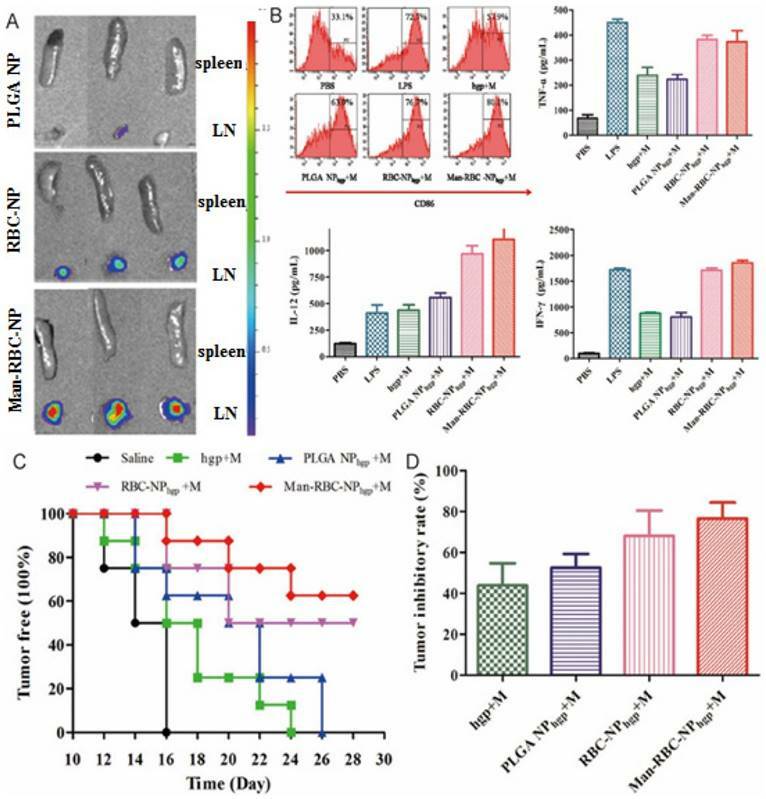 Sonication has therefore been explored to induce the fusion of PLGA nanoparticles with platelet membrane derived vehicles that display numerous “self-recognized” proteins . The frequency, power and duration of the sonication process should be optimized to maximize fusion efficiency and minimize protein denaturation and drug leakage. For both techniques, the cell membrane-to-nanoparticles ratio should be carefully controlled to ensuring complete surface coverage with cell membranes [37, 98]. Recently, microfluidic electroporation-based method was developed to achieve complete membrane coverage on the core nanoparticles, during which process pulse voltage, duration, and flow velocity should be optimized . Characterizations of resulting CNs for their physiochemical and biological functions are necessary before biological evaluation. Since the cell membranes can be distinguished from core nanoparticles in electron density, surface charge, permeability and protein composition, we can determine whether the cell membranes have been coated on the nanoparticles or not [37, 52, 77, 99]. Transmission electron microscopy (TEM) is regarded as a golden standard to characterize the core-shell structure of CNs, because the cell membranes that composed of lipids and proteins are usually of different electron density compared with the inner cores . Figure 2A shows typical TEM images of polymeric inner core, nano-sized membrane vesicle and the fusion nanoparticles. The CNs, under TEM, are white spherical core nanoparticles enveloped by light-gray circles indicating the coverage of cell membranes. On the contrary, the inner cores are spherical nanoparticles in sharp contrast with the background, and the hollow cell membrane derived vesicles are white circles due to the collapse of the vesicles. Membrane coating would change the size and ζ-potential of nanoparticles (Fig. 2B) , and could significantly enhance the colloidal stability of nanoparticles. For instance, PCL nanoparticles and MSNs stabilized by surfactants or interparticular electrostatic repulsion would aggregate in PBS during prolonged storage. In sharp contrast, their corresponding CNs were resistant to hyperionic treatment, due to the presence of ziwitterionic membrane protein (Fig. 2C) [60, 72]. Membrane coating could also retarded the drug release from the core nanoparticles by placing a diffusion barrier surrounding the particles (Fig. 2D) . Characterization of cell-membrane coated nanoparticles. (A) Typical TEM images of bare core nanoparticle, cell-membrane vesicle, and the fused cell-membrane coated nanoparticle. (B) The change in the size and ζ-potential of nanoparticles before and after cell-membrane coating. (C) The influence of cell-membrane to polymer ratio and trypsin-treatment on the stability of nanoparticles in PBS. (D) Dox release profiles from bare Dox loaded vesicles and Dox loaded platelet-mimicking vesicles under acidic and neutral pH. Representative SDS-PAGE result showing that the membrane proteins on RBCs were reserved after being processed into RBC vesicles (RVs) and RVPNs. (F) Western-blot and flow cytometry assay demonstrating the retention of characteristic membrane proteins on CNs. (G) TEM images of CNs reacted dynabeads® or colloidal gold that coated with antibodies against either exoplasmic or cytoplasmic domains of trans-membrane proteins. Reproduced with permission from reference [53, 69, 72, 77, 98, 116]. The above mentioned characterizations only tell whether cell membranes decoration is successful or not, but it is more important to verify the orientation and biological activity of the cell membranes on the surface of nanoparticles. Sodium dodecyl sulfate polyacrylamide gel electrophoresis (SDS-PAGE) and Western blot, widely used in molecular biology to monitor the protein expression profiles of cells , are therefore adopted as standard methods to characterize membrane proteins on CNs. Typically, SDS-PAGE is performed first to compare the protein profiles of source cell membranes, extracted membranes and derived nanoparticles (Fig. 2E). The presence of specific makers (such as CD47 on RBC membrane coated nanoparticles ) were further verified by Western-blot or flow cytometry (Fig. 2F). Comparable protein profiles and the preservation of protein markers are considered as good indicators for retained biological functions after membrane coating. However, the cell membrane is asymmetric, and thus correct topological orientation of the membranes on the core nanoparticles is also crucial for the cell-membrane coated nanoparticles to exert their desired functions. Antibody decorated Dynabeads® and colloidal gold conjugated antibodies could be used to characterize the orientation of cell membranes (Fig. 2F). In these circumstances, high-quality antibodies that only recognize the extracellular domain of targeted protein are required. Most anticancer drugs suffer from severe side effects that limit their clinic application. Nanomedicine prepared from PEGylated and bioresponsive materials have shown great successes in improving the therapeutic index of these anticancer drugs [100-102]. Recently, CNs have received many attentions because of their unique advantages, one of which is their easy functionalization. For instance, biomolecules such as CD47, glycans and sialic acid moieties can be introduced onto the surface of nanoparticles via enveloping them with membranes from RBCs to realize prolonged blood circulation [72, 98, 103]. Tumor targeting capability can be introduced to nanomedicine by decorating synthetic nanoparticles with membranes from macrophages, cancer cells or platelets [57, 59, 77]. In this section, we summarized the applications of CNs in cancer therapy with a focus on their extraordinary efficiency in vivo. Tumors are characteristic for their EPR effect, which preferentially traps nanoparticles and macromolecules. To maximize the intratumoral accumulation of nanoparticles, prolonged blood circulation of nanoparticles is required. The state-of-art techniques to improve the half-lives of nanoparticles include PEGylation, zwitterionization, and the recently developed self-peptide decoration [104, 105]. Zhang's Lab innovatively explored RBC membrane-camouflaged nanoparticles as long-circulating nanoparticles for cancer therapy . The half-life of DiD-labeled RBC membrane-camouflaged nanoparticles was significantly longer than PEGylated nanoparticles (39.6 v.s. 15.8 h), with substantial amount of camouflaged nanoparticles retained in blood even 72 h after injection (Fig. 3A). The prolonged circulation of RBC-CNs is mainly due to their membrane-oriented CD47 which can inhibit their phagocytosis by macrophages residing in RES systems (liver, lungs and spleen) (Fig. 3B) . In addition, RBC membrane coating could also minimize accelerated blood clearance - a phenomenon commonly observed in PEGylated nanoparticles during repeated dosing . Whenever necessary, one could easily introduce active targeting modalities into the system via lipid insertion, membrane fusion or covalent conjugation methods to improve cell binding and cellular entry of anticancer drugs [38, 47, 106]. Pharmacokinetic behavior and biodistribution of DiD-loaded nanoparticles. 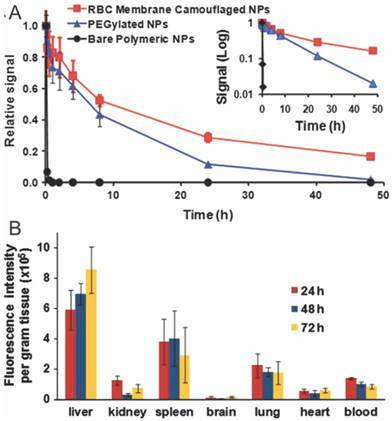 The pharmacokinetic profiles (A) and biodistrubution (B) of RBC membrane coated, PEGylated and bare nanoparticles after intravenous injection through the tail vein of mice. Reproduced with permission from reference . Piao and colleagues have used this technology to improve the hyperthermia therapy of gold nanocages on primary tumor (Fig. 4) . As we discussed above, gold nanocages have superior photothermal property, but their biocompatibility and selectivity are not satisfactory. RBC membrane coating dramatically prolonged the half-life of gold nanocage in circulation from 1 to 9.5 h, resulting in a two-fold increase in their intratumoral deposition at 24 and 48 h after injection (Fig. 4A). Subsequent localized laser irradiation (850 nm, 1 W/cm2, 10 min) raise the temperature of tumors in mice treated with RBC membrane coated gold nanocage (RBC-AuNC) to 42℃ and above (Fig. 4B-C), which induced the apoptosis and necrosis of cancer cells. As a result, the RBC-AuNC treated mice survived longer than other groups with complete tumor regression observed (Fig. 4D). Instead of AuNC, Rao et al. used clustered Fe3O4 magnetic nanoparticles as photosensitizer and contrast agent for MRI, and achieved enhanced intratumoral accumulation and anticancer activity when compared with bare magnetic nanoparticles . For most types of cancer, metastasis is one of the major causes of death. 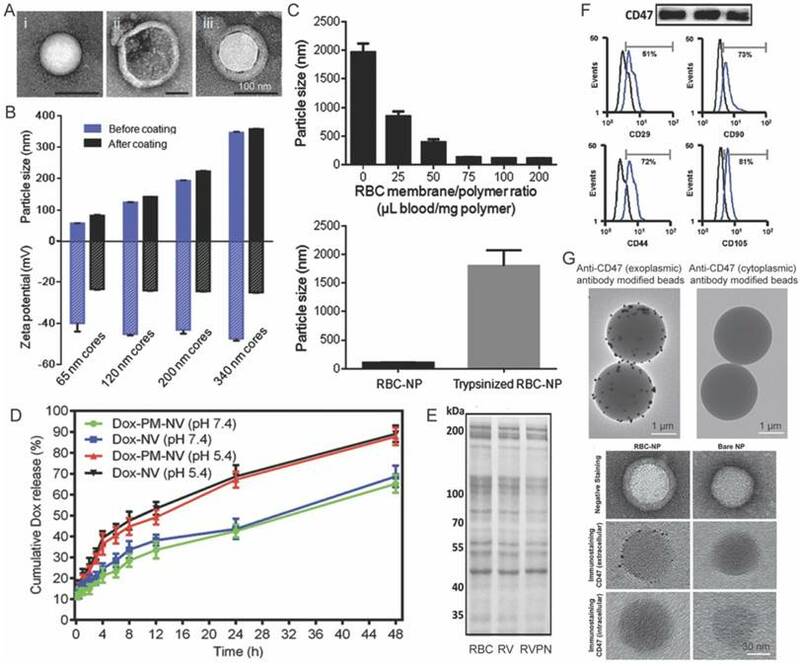 To inhibit and eliminate metastasis tumor, Li's group designed a novel RBC-mimetic vesicle-coated hybrid polymeric NPs (RVPNs) that could simultaneously target both primary breast cancer and their lung metastasis (Fig. 5) . 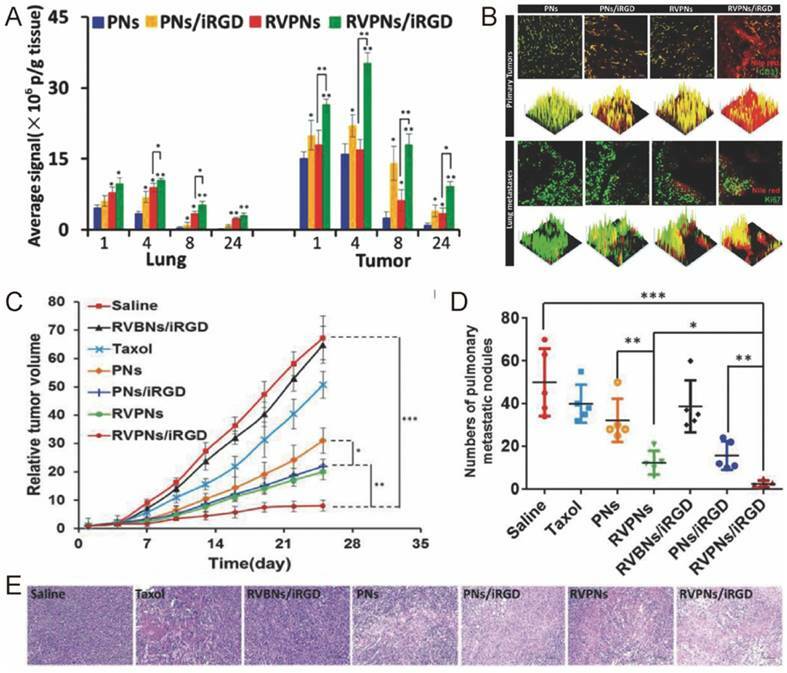 The RVPNs, when co-delivered with tumor penetrating peptide iRGD [107-109], showed increased accumulation than bare NPs in both primary tumors (5.59-fold) and their lung metastasis sites (4.2-fold) with enhanced tumor penetration (Fig. 5A-B). The growth of primary tumor was inhibited by 90% while lung metastasis was reduced by 95% without noticeable histological changes in major organs (Fig. 5C-E). To further improve the specificity of the treatment, they included photosensitizer DiR into the RBC membrane, and created NIR responsive nanoparticles for simultaneous tumor imaging, imaging guided hyperthermia therapy and thermo-triggered chemotherapy, receiving even better antitumor efficacy . Pharmacokinetic behavior and anticancer activity of cell membrane coated gold nanocages. (A) The retention and distribution of bare poly(vinylpyrrolidone) gold nanocage (PVP-AuNC) and RBC-AuNC after intravenous injection. 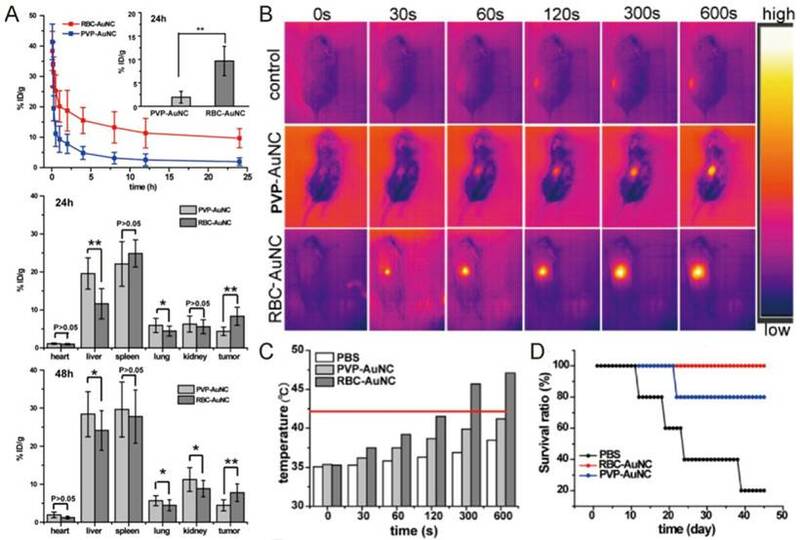 Thermographs (B) and the temperature (C) in the tumors of mice treated with PVP-AuNC and RBC-AuNC combined with laser irradiation (850 nm, 1 W/cm2, 10 min). (D) The mouse survival ratio from different treatment groups. Reproduced with permission from reference . The biodistribution, anticancer activity and toxicity of RVPNs co-delivered with iRGD. (A) The distribution of RVPNs/iRGD and control formulations in the lungs and tumors. (B) 2D- and 3D-reconstructed confocal laser scanning microscope (CLSM) images of the tumor/lung distribution of RVPNs/iRGD and control formulations in the primary tumors and the lungs with metastatic foci 24 h post i.v. administration. (C) The growth of primary tumor and (D) the number of pulmonary metastatic nodules in mice after repeated treatments. (E) Representative H&E staining images of tumor sections treated with different formulations. Reproduced with permission from reference . Aside from successful inhibition of primary and metastasized tumors, prolonged antitumor effect is required. Inducing antitumor immunity is one promising way to achieve this goal. Guo and colleagues thus delivered a mannose decorated RBC coated nanoparticle (Man-RBC-NPhgp) (Fig. 6) . Man-RBC-NPhgp significantly improved the accumulation and retention of hgp10025-33 in draining lymph node, with enhanced uptake and activation of antigen presenting cells (Fig. 6A-B). Repeated vaccination with the nanoparticles induced profound protection against melanoma in mice both preventatively and therapeutically. The pre-vaccinated mice became more resistant to the formation of melanoma after inoculation, while the tumor growth was greatly retarded after vaccination (Fig. 6C). More importantly, the lung metastasis of melanoma was also reduced by more than 70% (Fig. 6D). Circulating CNs must accumulate in tumors to be effective. To achieve this goal, tumor microenvironment-responsive materials and neovasculature targeting ligands have been extensively explored, taking advantages of the pathological features of tumors [110, 111]. Actually, cells including mesenchymal stem cells (MSCs) and immune cells are actively recruited to the tumors in vivo [112, 113]. For instance, the process of tumor formation and progression requires active recruitment and proliferation of circulating stem cells, majority of which are mesenchyme stem cells (MSCs) [114, 115]. Given the important role of MSCs, Naama et al. produced MSCs-derived nanoghosts (NGs) as a targeted drug delivery system for the treatment of cancer . The NGs exhibited desired selectivity towards two kinds of cells PC3 and MCF7. Due to their great affinity for tumor, the growth of tumor was significantly retarded upon a single intraperitoneal (IP) injection in vivo. Gao and co-workers took one step further and coated their gelatin nanogels with membranes derived from MSCs for tumor specific delivery of Dox . 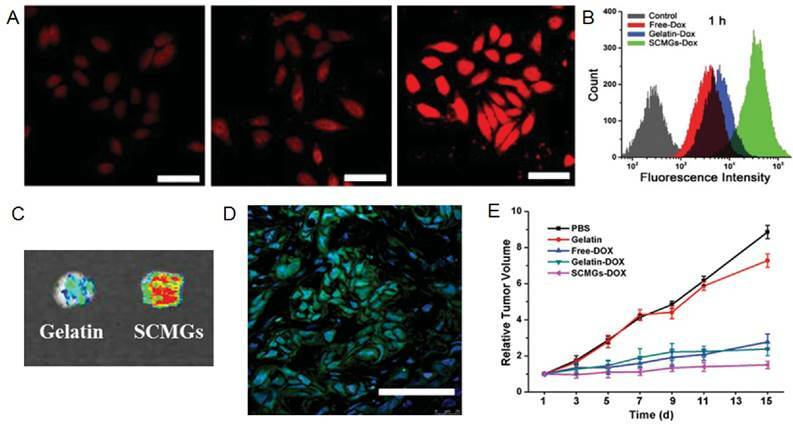 MSCs-decorated CNs (SCMGs-Dox) significantly improved the cellular uptake, intratumoral accumulation and intratumoral penetration of Dox when compared with bared gelatin nanoparticles (Gelatin-Dox) and free Dox (Fig. 7A-D). SCMGs-Dox was the most potent in inhibiting the growth of tumors (Fig 7E). The efficacy of Man-RBC-NPhgp. (A) The image of LN and spleen at 24 h after intradermal injection of Man-RBC-NPhgp. (B) Dendritic cells maturation induced by combination Man-RBC-NPhgp with monophosphoryl lipid (MPLA) in vitro, probed by the expression of CD86 and secretion of TNF-α, IL-12, and IFN-γ from BMDCs treated with different formulations. (C) Efficacy of Man-RBC-NPhgp in preventing tumor occurrence in vivo. (D) The growth inhibition of established tumor by different vaccines. Reproduced with permission from reference . Cancer targeting and inhibition capability of MSC-CNs. CLSM images (A) and quantitative analysis (B) of the HeLa cells after 1 h incubation with withfree Dox, gelatin-Dox, and SCMGs-Dox. Scale bar = 25 µm. (C) Intratumoral accumulation of doxorubicin delivered by gelatin or SCMGs 24 h after administration. (D) Frozen section of the tumor 24 h after FITC-SCMGs (green) injection. Scale bar = 100 µm. (E) Tumor volume changes in mice received different treatments. Reproduced with permission from reference . Tumor has capability to induce chronic inflammation which would recruit leukocytes towards tumors [117, 118]. Parodi and colleagues encapsulated the silicon particles with leukocytes derived membranes to obtain leukolike vectors (LLVs) (Fig. 8) . 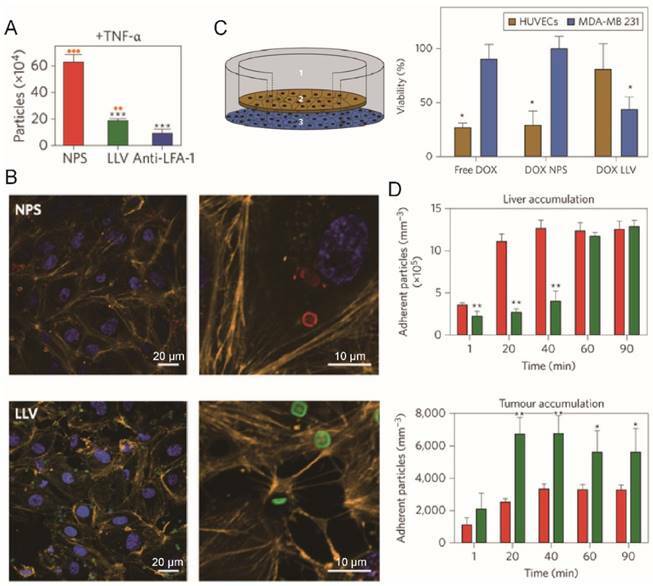 LLVs could enter inflamed endothelial cells (TNF-α pretreated) through LFA-1 mediated pathway involving the reorganization of intracellular actin filaments into basket-like structures, and avoided lysosomal sequestration, while bare silicon particle could not (Fig. 8A-B). In a cellular blood vessel model (Fig. 8C), around 70% of Dox-loaded LLV (Dox LLV) penetrated through the monolayer form by endothelia cells and reached the beneath cancer cells, compared with 30% penetration for bare particles. Dox was therefore delivered across the cell monolayer to kill the beneath residing cancer cells. Dox LLVs also increased the intratumor deposition of drug (2-fold) with slower liver clearance (Fig. 8D). In consistent with these results, He and colleagues found that capsule-cushioned leukocyte membrane vesicles (CLMVs) showed lower accumulation in the liver and higher deposition in the tumor when compared with bare vesicles . In addition to leukocytes, cell membranes from monocytes and macrophages have also been used to decorate synthetic nanoparticles such as PLGA nanoparticles, gold nanoshells, MSNs and liposomes [59, 63, 119, 120]. For instance, Cao and colleagues coated their emtansine-loaded liposomes with macrophage membranes to combat lung metastasis of breast cancer . The CNs showed strong affinity for cancer cells via the interaction between integrin α4 (on macrophage membrane) and vascular cell adhesion molecule-1 (VCAM-1, on cancer cells), achieving 2- to 3-fold increase in accumulation in lung metastasis sites and reduced number of metastasis nodules. The capability of a nanomedicine to recognize cancer cells after their intratumoral accumulation is crucial for subsequent cellular entry, which is another critical step during drug transportation. The most popular strategy is decorating nanomedicine with ligands that can bind to specifically overexpressed receptors on cancer cells . Fang et al. first explored homotypic targeting strategy for MDA-MB-435 cancer cell-targeted drug delivery, where they coated PLGA nanoparticles with plasma membranes derived from the same type of cancer cells . The cancer cell coated nanoparticles (CCNPs) showed strong affinity for MDA-MB-435 cancer cells resulting in 20- and 40-fold higher cellular uptake compared with bare PLGA nanoparticles and RBC-CNs, respectively (Fig. 9A), while no difference was observed on human foreskin fibroblasts. The homotypic affinity between cancer cell membranes is believed to be derived from interaction between carcinoembryonic antigen and galectin-3 expressed on cancer cells  Sun and colleagues fabricated a 4T1 cell membrane-coated biomimetic drug delivery platform with the same strategy to combat breast cancer and its metastasis in lungs . In consistent with previous observation by Fang and co-workers, the 4T1 derived CNs (CPPNs) preferentially targeted to 4T1 cancer cells but not lung fibroblast WML2 cells and macrophage RAW264.7 cells. Furthermore, the accumulation of model drug in primary tumor and metastasized site in lungs increased by 3.3- and 2.5-fold when delivered with CPPNs instead of bare nanoparticles (Fig. 9B). After multiple dosing, both the growth of orthotopic tumor and the lung metastasis were greatly inhibited (Fig. 9C-D). They further decorated Dox-loaded gold nanocages with cancer cells membranes in the aim of realizing simultaneous tumor imaging and dual-modality treatment . Upon light irradiation, gold nanocages produced heat that eradicate surrounding cancer cells via hyperthermia effect and at the same time could trigger the release of Dox from cell membrane-coated nanocages to exert chemotherapy against cancer cells. In addition to cancer targeted drug delivery, cancer cell membrane coated nanoparticles could also be used as imaging contrast and vaccine, which would facilitate further treatment of cancer [57, 61, 123]. Tumor homing efficiency of LLVs. (A) Quantification of particle adhesion to inflamed endothelium (pretreated with TNF-α) following 30 min of flow. **P<0.01, ***P<0.001. (B) Confocal microscopy of HUVEC treated with NPS (red) or LLV (green) for 3 h show reorganization of actin filaments (orange). (C) Schematic of a transwell chamber for assaying transport across an endothelial monolayer, and its application in the studies of HUVEC (endothelial, brown) and MDA-MB-231 (cancer, blue) cell viability. (D) Time-dependent accumulation of systemically administered J774-derived LLV (green) and NPS particles (red) in the liver and B16 melanoma tumor of live mice. Reproduced with permission from reference . Homotypic targeting and treatment of tumor with cancer cell membrane coated nanoparticles. (A) Flow cytometric analysis of MDA-MB-435 cells incubated with CCNP and control formulations. 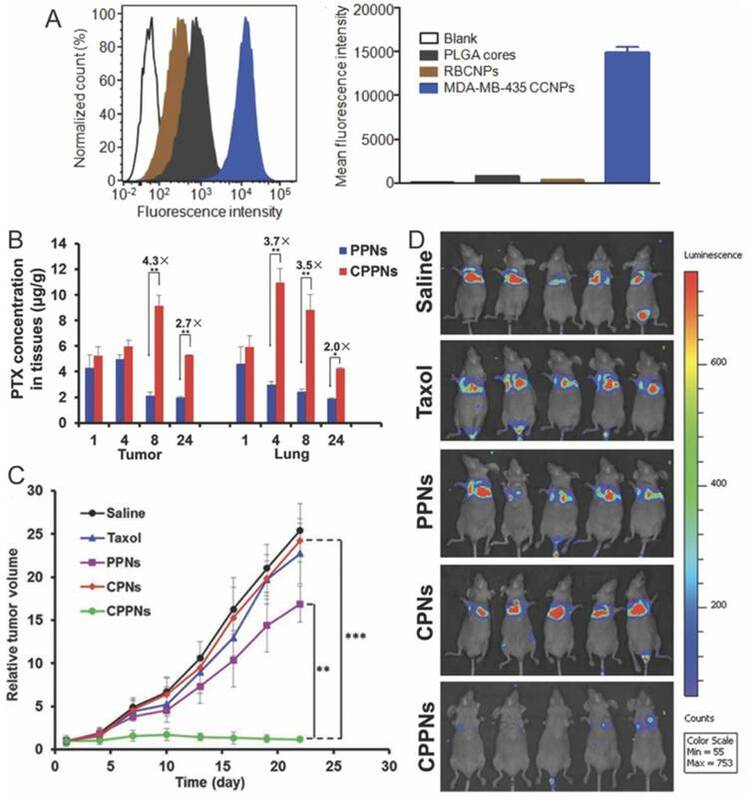 (B) Quantitative analysis of tumor and lung distribution of PTX delivered with CPPNs. (C) Tumor-growth profiles in mice treated with CPPNs or control groups. (D) In vivo bioluminescence imaging of the mice bearing lung metastasis of the 4T1 bloodstream metastasis model. Reproduced with permission from reference . Recent studies on breast cancer showed that cancer cells are able to disseminate long before the establishment of detectable primary tumor [124, 125]. These findings highlight the importance to target and eradicate circulating tumor cells (CTCs). Platelets play an important role during tumor metastasis, because they could recognize and interact with CD44-overexpressing CTCs in blood via P-selectin and form an outer shell which aid the survival of CTCs during circulation [77, 126]. At the same time, the platelets could also target niches for cancer metastasis through recognizing exposed extracellular matrix . However, platelets themselves are not able to kill cancer cells, so they should be armed to exert anticancer activity. For instance, decorating platelets with immune-modulating anti-PDL1 antibody can promote the delivery of anti-PDL1 antibody to the tumor sites and target CTCs, and therefore inhibit the tumor recurrence and metastasis . Circulating cancer cell binding and eradication metastasis efficiency of platelet mimicking nanoparticles. (A) Extracellular distribution of TRAIL loaded nanovehicle (TRAIL-NV) and TRAIL loaded platelet membrane coated nanovehicle (TRAIL-PM-NV) after 2 h incubation. (B) The induced apoptosis of MDA-MB-231 cells treated with TRAIL-Dox-NV and TRAIL-Dox-PM-NV after incubation for 12 h using the APO-BrdU TUNEL assay. (C) Region-of-interest (ROI) analysis of fluorescent intensities from the tumors and normal tissues. (D) Representative images of the MDA-MB-231 tumors after treatment with different TRAIL/Dox formulations at day 16 (from top to bottom, 1: saline, 2: TRAIL-Dox-NV, 3: TRAIL-PM-NV, 4: Dox loaded platelet membrane coated nanovehicle (Dox-PM-NV), 5: TRAIL-Dox-PM-NV) at TRAIL dose of 1 mg·kg-1 and Dox dose of 2 mg·kg-1. (D) Quantification of visible metastatic nodules. i) Saline; ii) TRAIL-Dox-NV; iii) TRAIL-Dox-PM-NV. Reproduced with permission from reference . Hu et al. designed platelet-mimicking vesicles for the delivery of Dox and TRAIL (TRAIL-Dox-PM-NV) . The surface-conjugated TRAIL here bond to the DR4 and DR5 on the tumor cell surface, and augmented the cellular uptake of TRAIL-Dox-PM-NV by cancer cells [129, 130]. Indeed, the TRAIL-Dox-PM-NV showed strong affinity for MDA-MB-231 human breast cancer cells, and induced profound cell apoptosis after 12 h incubation (Fig. 10A). The high affinity of TRAIL-Dox-PM-NV for MDA-MB-231 cells also significantly improved the intratumoral accumulation of anticancer drug (Fig. 10B). 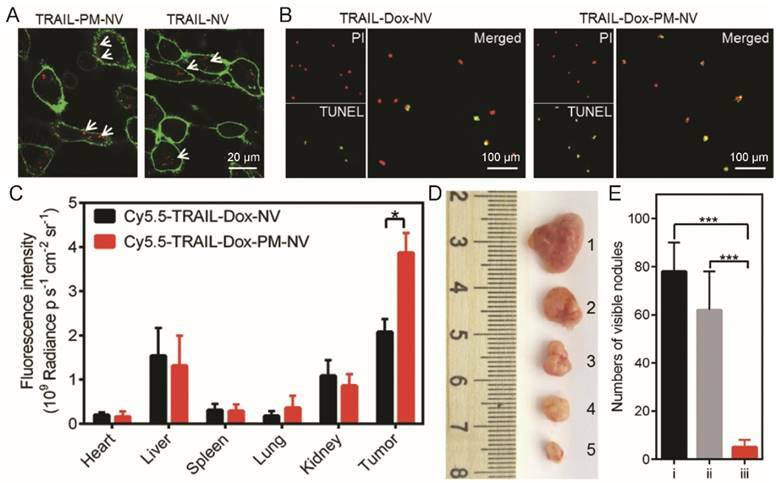 More importantly, TRAIL-Dox-PM-NV treatment killed the intravenous injected MDA-MB-231 cells more efficiently than Dox and TRAIL-loaded nanovehicle (TRAIL-Dox-NV), and the number of lung metastasis sites reduced to less than 10% of the non-treated groups (Fig. 10C). Although the platelet-membrane-coated nanomedicine can specifically target tumor sites, the inflammation signals released by the tumor was not strong enough to induce high intratumoral accumulation of nanomedicine. To address this issue, the same group developed a Arg-Gly-Asp (RGD) decorated and tumor necrosis factor α (TNF-α) loaded nanogel as signal transmission nanocarrier A (NCA) for combination use with their platelet-membrane-coated nanocarrier B (NCB), a platelet membrane-coated paclitaxel (PTX) loaded acid responsive dextran nanostructure . NCA can bind to neovasculatures in the tumor and amplify inflammation signals which then recruited the NCB to exert antitumor activity. Successful cancer therapy requires drugs being specifically delivered to the tumors. Carriers made of synthetic materials or derived from living objects have been explored. Recently developed cell membrane-camouflaged strategies created nanocarriers from both synthetic and biological materials, and thus are versatile in cargo encapsulation and feasible in surface functionalization. This strategy has been proven to be efficient in delivering drugs ranging from small molecular, biomacromolecules to functional nanoparticles, and also feasible in achieving prolonged circulation, tumor homing, cancer cell specific targeting and etc, using cell membranes harvested from RBCs, platelets, macrophages, cancer cells, stem cells and others. The success of CNs in drug delivery mainly attribute to two aspects. First, cell membrane enveloping greatly improve the stability of synthetic nanoparticles during transportation, minimize the clearance of nanoparticles by macrophages and monocytes, and enhance affinity of nanoparticle for cancer cells. Second, the core nanoparticles enable the delivery of various treatments to the cancer cells including chemotherapy, photothermal therapy, immunotherapy and etc. Although it is obvious that cell membrane-camouflaged nanoparticles hold great potential in cancer therapy, there are challenges must be addressed before the clinical translation of the CNs. The biggest and maybe also the most important challenge is their large scale production with acceptable batch-to-batch variation. The limitation of the source cell membrane is one of the causes, because some types of cells such as stem cells are rare in the body, while some others such as leukocytes are highly heterogeneous. The procedures used for fusion must be scalable and optimized for maximized efficiency. Recent effort to achieve complete membrane coverage using microfluidic electroporation technology is an important attempt to achieve this goal. Quality control of the CNs is another major challenge must be resolved. The source cell membrane must be free of contamination such as pyrogen and virus, and portions of CNs with denatured proteins should be eliminated in order to prevent potential immune response against endogenous antigens. Given the great potential of cell membrane coated nanomedicine in cancer therapy, however, we believe these issues will be addressed in the near future after active pursuing in the area, and the cell membrane coated nanomedicine would make a great impact to the drug delivery technology. PEG, poly(ethylene glycol); EPR, enhanced penetration and retention; CPPs, cell penetrating peptides; ABC, accelerated blood clearance; CNs, cell membrane-coated nanomedicines; RBC, red blood cell; WBC, white blood cell; PLGA, poly(lactic-co-glycolic acid); PCL, poly(ε-caprolactone); MSN, mesoporous silica nanocapsules; AuNPs, gold nanoparticles; MSNs, mesoporous silica nanoparticles; LSPR, localized surface plasmon resonance; MNs, magnetic nanoparticles; NIR, near-infrared; MRI, magnetic resonance imaging; TEM, transmission electron microscopy; SDS-PAGE, sodium dodecyl sulfate polyacrylamide gel electrophoresis; RBC-AuNC, RBC membrane coated gold nanocage; Man-RBC-NPhgp, mannose decorated RBC coated nanoparticle; MSCs, mesenchymal stem cells; NGs, nanoghosts; Dox, doxorubicin; LLVs, leukolike vectors; CLMVs, capsule-cushioned leukocyte membrane vesicles; VCAM-1, vascular cell adhesion molecule-1; CCNPs, cancer cell coated nanoparticles; CTCs, circulating tumor cells; TRAIL-Dox-PM-NV, TRAIL decorated doxorubicin loaded platelet-mimicking vesicles; TRAIL-Dox-NV, TRAIL-decorated doxorubicin loaded nanovehicle; RGD, Arg-Gly-Asp; TNF-α, tumor necrosis factor α; PTX, paclitaxel; NCA, nanocarrier A; NCB, nanocarrier B. The authors thank the National Basic Research Program of China (2014CB931900), the National Natural Science Foundation of China (81521005, 81630052, 81671808), Key scientific research program of CAS (QYZDJ-SSW-SMC020), Shanghai Pujiang Program (15PJ1409900), and Youth Innovation Promotion Association of CAS (2017335) for financial support.